Often written off as a forgettable chapter in hip hop’s past, g-funk was an undeniable factor in cementing rap as a musical force to be reckoned with. It borrowed from Bernie Worrell’s synth lines and 70’s funk breaks as much as it did from sleeker 80’s boogie productions from Mtume, One Way, Zapp, and many others. 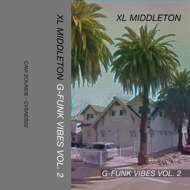 XL Middleton aims to bridge the gap between this and today’s modern funk with G-Funk Vibes Vol. 2. The aim is to give you that same feeling you get from modern funk - sunshine and synthesizers via selections culled from XL’s personal vinyl stash. The tracks range from overlooked major label remixes to obscure private pressings. It’s the perfect soundtrack for a sunny Sunday afternoon and a cold brew - or just imagining you have both.